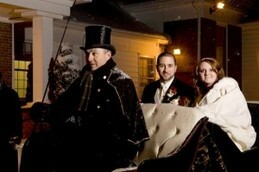 Sleigh rides are $90/half hour with cash payment and $100 if paid with a credit card. Sleigh holds up to 4 people on the sleigh. Prices vary during Holidays. $6.04 booking fee. If the weather does not cooperate, we will contact you that day and the appointment can be changed. The reservation is a private sleigh ride for you and whom else you invite, up to 4 adults. Please arrive 10 minutes ahead of appointment. If late, you risk the ride being shortened to accommodate other reservations. The ride begins at the front gate of Heberle Stables just past the first house in front of the blue shed. Please park to the right of the first house or just past the second house by the barn. Sleigh rides can be scheduled by booking online. Please click the following link to schedule an appointment. Your credit card will not be charged, cash payment due upon arrival. Your credit card will only be charged if it is a no show appointment. Wagonette holding 8 people, $150/half hour. Please call or email for availability/booking. 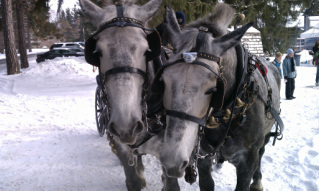 Sleigh rides will begin booking as soon as trail season is over. Sleigh Ride , 1 sleigh for up to 4 people of your party!